Sycamore Canyon and the Big Sur Valley. 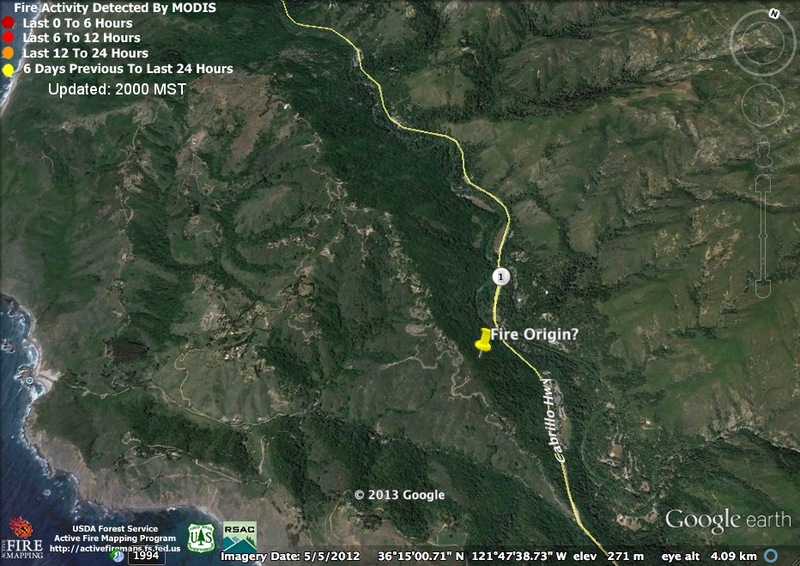 Pfeiffer Ridge is at the back of the Sycamore Canyon drainage, running parallel to, and just to the west of, Hwy. 1. Pfeiffer Beach is at the bottom of the photo. As many of you have been pointing out to us this morning. A fire broke out on Pfeiffer Ridge last night and has been burning through the Sycamore Canyon drainage toward the ocean. We’ve seen reports of as many as 500 acres burned and structures, including homes, have reportedly been destroyed. A heavy smoke layer has now reached Carmel and the Monterey Peninsula. No heat detections have yet appeared on the MODIS maps. The fire has apparently reached Clear Ridge in places, but we haven’t heard any reports of it moving further to the west than that. 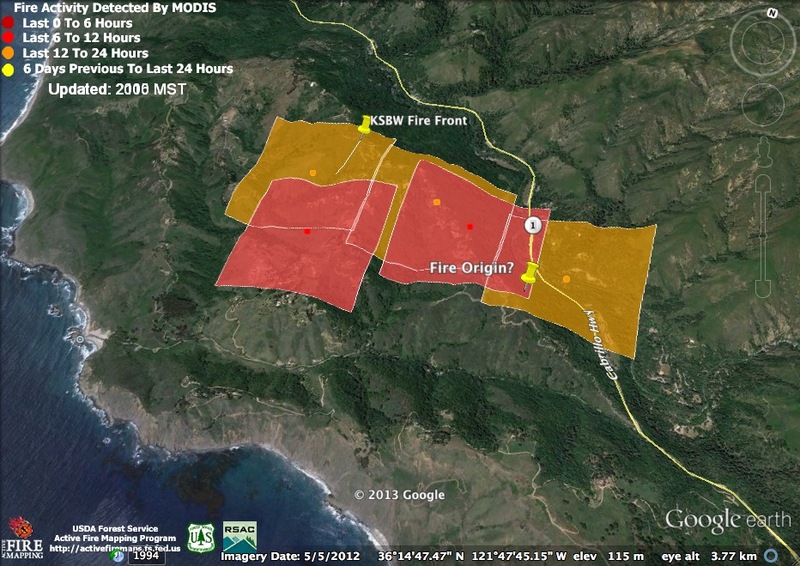 11:15 am 12/16/13 Update: As many as 15 homes are now estimated to have burned, including the home of the Big Sur Fire Chief, Martha Karstens. There are reports that the fire began along the Buzzard’s Roost Trail. That would place the point of origin somewhere in the area indicated above. 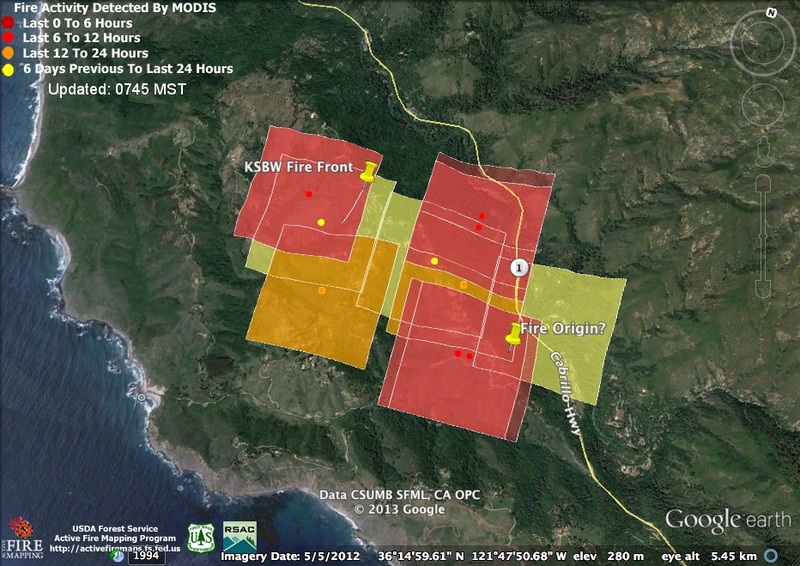 Since then, the fire has burned generally toward the west across a thickly populated (by Big Sur standards) series of ridges. 4:15 pm 12/16/13 Update: Official word is that 15 homes have burned. Unofficial reports say as many as 20 homes have been destroyed. KSBW has posted a video providing an overhead view of the fire. They don’t say when it was shot, but it does show a fire front slowly moving west in the location indicated below. 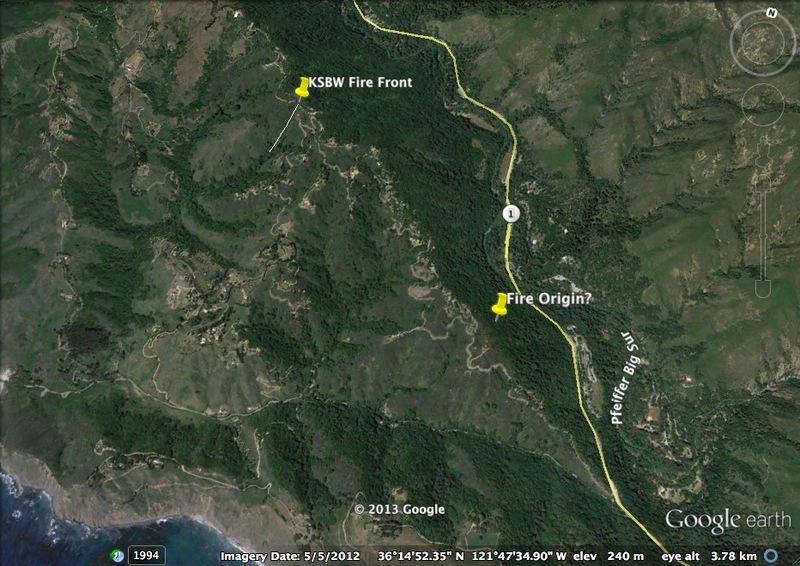 We’ve drawn in a white line to indicate the westernmost front of the fire as shown in the video. The fire front continued down toward Bear Killed Two Calves Creek and back in the direction of Sycamore Canyon Rd., but we didn’t get a clear enough view to be willing to draw any more. 1) We’ve been hearing stories all day about the fire burning along Pfeiffer Ridge all the way to the Emile Norman house and Clear Ridge, but the photos we’ve seen, and the KSBW video, don’t back this up (although we don’t know when the video was shot or how far the fire might have traveled since then). Based on what we’ve seen, we’re guessing the fire still hasn’t made it that far. 2) A December fire underlines just how dry a year 2013 has been. Yet this is still the rainy season and heavy rains might be only weeks away. Hard rain on recently burned slopes can cause real problems. 3) Losing a home is never easy, but those who live in fire country brace themselves for the possibility every fire season, only relaxing when the rains begin to fall. Part of what makes this fire so traumatic is that it arrived when least expected; in the middle of the night, in the middle of December, and following enough rain to start the new grass sprouting. 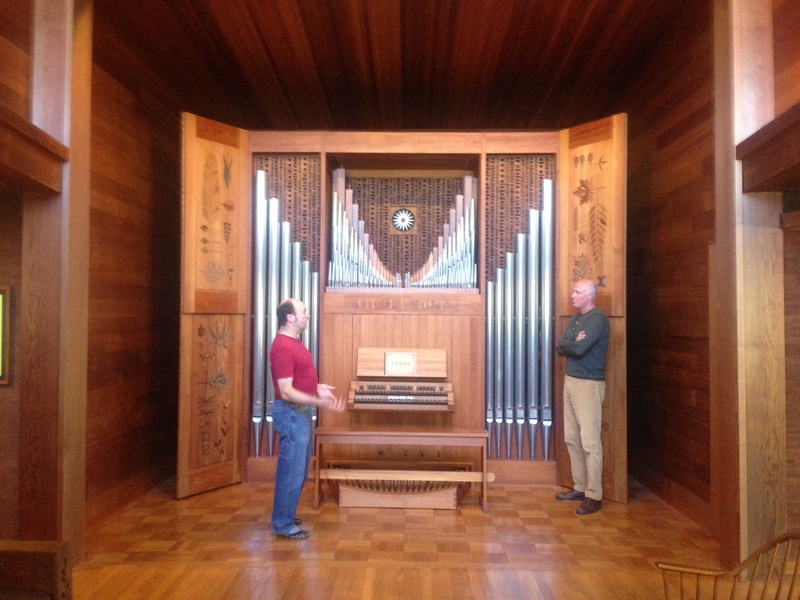 The pipe organ in the Emile Norman home on Pfeiffer Ridge. This house is one of Big Sur’s true cultural treasures and we hope we’re right in guessing that it’s still safe. 8:30 pm 12/16/13 Update: The fire has been detected by the MODIS satellites. The yellow dots were detected in the early morning hours and the red dots early this afternoon. Remember that the larger squares are intended to indicate the expected margin of error, rather than fire boundaries. The fire has NOT crossed Hwy. One, for instance, even though one dot and a portion of two squares appear on the east side. The location of these detections only strengthens our belief that the fire has not reached the Norman house, Clear Ridge, or Bear Killed Two Calves Creek. 7:15 am 12/17/13 Update: The fire seems to have had an active night. Check out this amazing image from the National Weather Service, of the fire outshining the cities of the Monterey Peninsula and Salinas Valley. This image suggests that at that time the fire was expanding to the west, along the side of Pfeiffer Ridge, to the south (although still north of the Sycamore Canyon Rd. ), and to the north, as it continued to creep down toward the river on the Big Sur Valley side of Pfeiffer Ridge. 2:20 pm 12/17/13 Update: No new heat detections have yet been posted, but we’ve moved our “Ignition Point?” pin to better reflect the current belief that the fire started near the Buzzard’s Roost Trailhead or the State Park Group Camping Area (both of which are near the Hwy. One bridge over the Big Sur River). The reports (attributed to the Sheriff’s Office) circulating earlier today about a voluntary evacuation being called for the Big Sur Valley have been denied by the Forest Service. The only areas under evacuation are Pfeiffer Ridge and other roads in the immediate fire area. NOTE: The Forest Service has just updated Inciweb to state that an “evacuation watch” has been issued for the west side of Hwy. One between Fernwood and the River Inn. This is undoubtedly because the fire continues to creep down slope toward the river in this area. New estimates put the fire’s size at 550 acres. Containment is estimated at 5%, which simply means that some fire lines have been built, but much more work remains to be done. 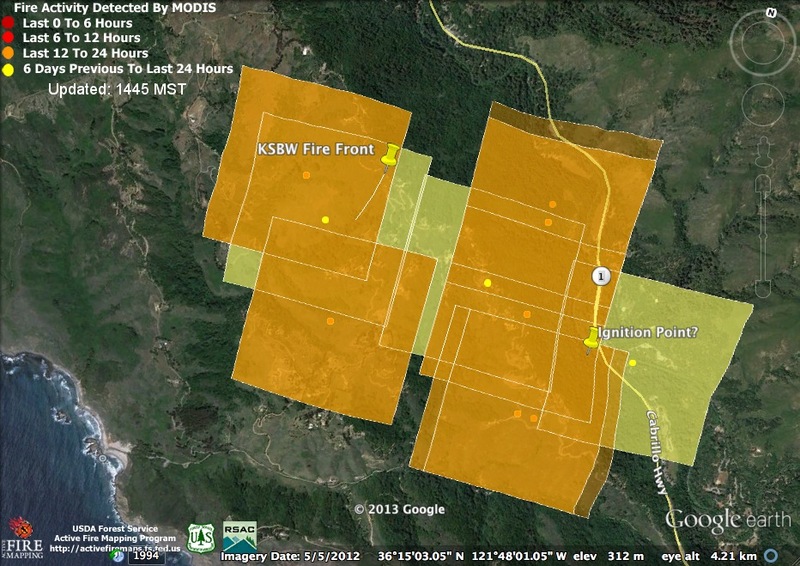 More accurate estimates will have to wait until the fire has been better mapped. Latest reports are that as many as 30 homes have been “affected” by the fire. A very sad situation, indeed. 5:20 pm 12/17/13 Update: At the 4:00 pm Community Meeting the Forest Service announced that the fire has burned 769 acres and destroyed 22 structures. It’s not clear if all of those were homes (some say 14 were homes). They also upped the containment estimate to 20%. They expect full containment by Friday night. If the fire had made any big runs into new territory last night or today, we probably would have heard about it by now, so we think it’s safe to assume that it’s been smoldering along pretty gradually. A change in the weather is expected tomorrow afternoon. On the plus side, it will make burning conditions less favorable by raising humidity. On the negative side, it will bring a northwest wind that may gust to better than 30 mph on the higher ridges. If there is still enough fire to be pushed, that wind would tend to push the fire away from Clear Ridge and toward Sycamore Canyon Rd. and Highway One. Cold, moist air can be pretty rough on a fire, though, so we think it’s unlikely to burn many more acres than it already has. 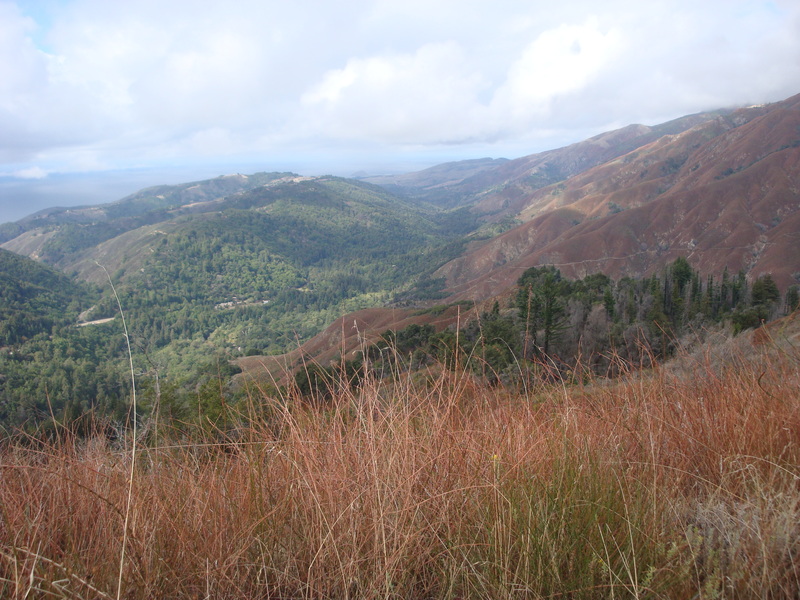 The Big Sur Valley with Pfeiffer Ridge, thickly carpeted in green forest, as it appeared in October, 2010. 3:15 pm 12/18/13 Update: Word today is that all 22 structures burned were residences. Acreage has been upped to 850 and containment to 50%. Some fire maps have been circulating today and this one from the National Weather Service is the best we’ve seen. It’s a bit behind the times, though, as the fire reached the intersection of Pfeiffer Ridge Rd. and Highway One this morning (well beyond the boundary on the map), as shown in pictures posted by Big Sur Kate. The maps suggest that the fire has now crept as far as the Emile Norman house (which we expect is still OK) on Pfeiffer Ridge and, in at least one spot, down the hill as far as Bear Killed Two Calves Creek. Firefighters have clearly been working yesterday and today to bring the southern end of the fire down to Sycamore Canyon Rd. 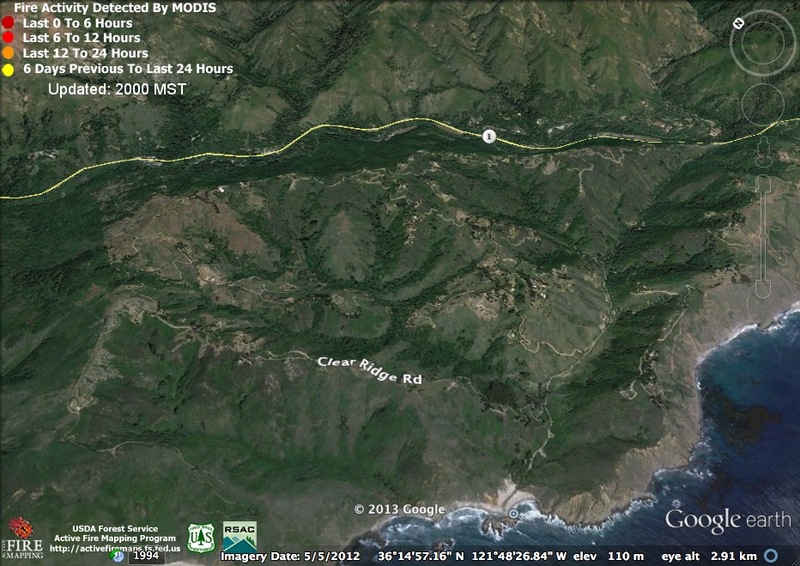 and Highway One, in order to deprive the fire of fuel that could spark a run when the winds shift to the northwest. 8:00 am 12/20/13 Update: 917 acres and 93% contained. Full containment still expected by this evening. 9:00 pm 12/20/13 Update: 917 acres and 100% contained. Sadly, 34 structures, most of them homes are now thought to have burned. We recommend that donations to support those who have lost their homes be made through, this local site, which will deliver 100% of your donation to wherever you want it to go. This entry was posted on Monday, December 16th, 2013 at 10:09 am and is filed under Big Sur, Fire, Flood & Apocalypse, Santa Lucias. You can follow any responses to this entry through the RSS 2.0 feed. You can leave a response, or trackback from your own site. XT, thanks for the maps and factual info. I agree with you that I don’t think it has gotten as far Bear Killed Two Calves Creek, as I have friends there. Haven’t heard from them (not surprisingly)!but am confident I would have heard, had it gotten that far. OTOH, it is night, reports are getting scarce, and who knows what can happen by dawn. I am going up there tomorrow and will post what I can find out. Thanks, Kate. As usual, you’ve been far more on top of the evacuations, road closures, and everything else the community actually needs to know, than the professional media. Anyone who wants the latest updates should be sure to check out the Big Sur Kate blog (see the blogroll on the right of this page).